As a college student, you may not be earning a lot of money. But the best way to hang on to the money you do have is through budgeting. This is how you do it. Wherever you are in your college journey—and wherever you are in the economic spectrum—budgeting skills and financial responsibility will influence the opportunities you have throughout your life. Even though most college students are not yet financially independent, 62% say they use a budget to keep track of their expenses, and 77% pay their own credit card bills. So if you don’t have a budget yet and you want to start one, or if you want to make sure the budget you have is in good shape, this article is the place to start. 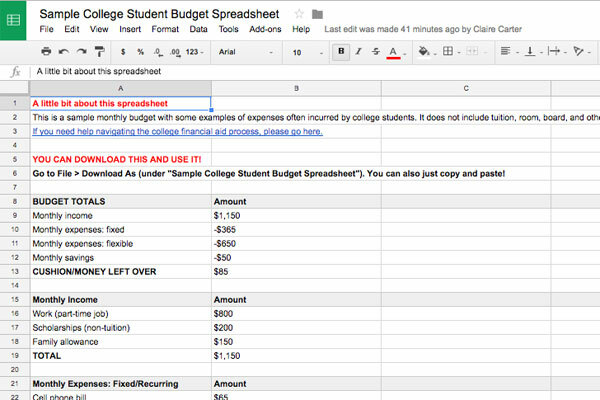 And if you’re looking for a good basic budget spreadsheet, here’s one just for college students! As a college student, you will likely need to coordinate with your family as you make your budget, especially if they are directly providing you with spending money. If that’s the case, you can show how responsible you are by coming up with a schedule or system for exchanging that money. For example, you could suggest having your parents deposit $75 into a shared bank account on the first and 15th of every month, and you could plan your budget around that schedule. You probably don’t have a lot of recurring bills as a college student, but you might be responsible for your monthly cell phone bill, car payment, car insurance, and/or rent if you live off campus. These are your fixed/recurring expenses, and the first step in creating your budget is to list them all out. Once you know where your money is coming from and where it’s going, you need to compare your expenses to your income to make sure they balance out. If your expenses exceed your income, you’ve got yourself a problem. With a little tweaking and thriftiness, you may be able to bring down your expenses. Or you may need to seek additional scholarships, financial aid, and forms of income to make up the difference. Other than the many budgeting apps out there, it is wise to check with your bank to see if they have an app of their own. On my personal banking app, I am able to instantly deposit checks by taking a picture of it, check up on how much money I have, and transfer funds in between my checking and saving accounts. If your bank isn’t local (especially if you traveled far from home for college), having an app is especially useful, since you won’t be able to physically walk into the bank to take care of things. But whatever you do, remember that creating your budget is just the first step; it’s important to manage your spending so you stick to it. Just like you set a budget for spending, you should also set a budget for how much you would like to save. Consistent saving is a huge principle that many financial advisors say can be more successful than constantly investing in the ever-changing global market. Set a goal of committing to saving a percent of your monthly paycheck, and over time it will allow you to get in the habit of always putting something away. I personally put at least 10% of my paycheck into my savings. It may not be a lot, considering I am only a college student making minimum wage, but every little bit counts. The last basic college budgeting tip is to get rid of the temptation to spend money whenever possible. If your weakness is ordering stuff online, it may be wise to use a site blocker during periods you know you shouldn’t be spending money. Or if you’re constantly going out with friends, you can be upfront about your budget and suggest cheaper or free events. When you do go out, bring only a set amount of cash to spend instead of a credit card to limit your spending. 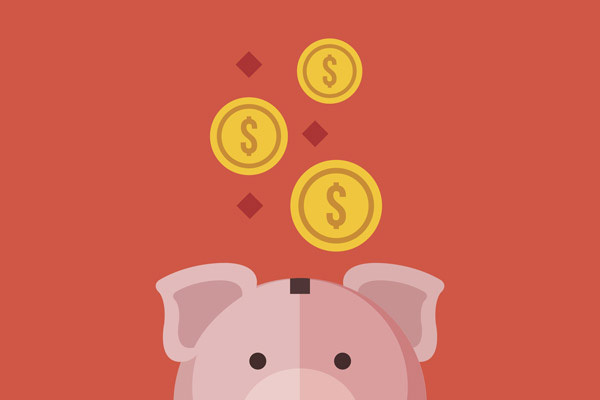 Budgeting can be a daunting for students, but learning how to manage your money is a big and fairly important part of college life. Once you get the hang of it, you will feel less stressed about money now and set yourself up for financial freedom throughout your life.